The patient was referred to our practice by the Neurosurgery service for treatment of a mandibular symphysis fracture. Patient had a loss of consciousness following a bar room fight. Medical history revealed a 30 y.o. 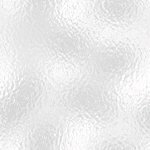 white single male with no known drug allergies, no medications, previous operations, or serious illnesses. Family history was noncontributory. Social history was positive for cigarette smoking and daily beer consumption. Oral examination revealed missing teeth # 1, 2, 14, 18, and 32. A traumatic malocclusion was noted. 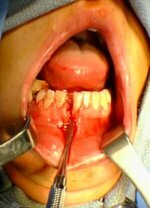 Hemorrhage and laceration of the gingiva was noted in area # 25 and # 26. Gingival recession was present on the labial surface of # 25. Bimanual manipulation of the mandibule revealed a symphysis fracture between teeth # 25 and # 26. The mandibular condyles, angles, and body were intact. Severe displacement of the fracture occurred when the patient tried to obtain centric occlusion. Sublingual ecchymosis was present. 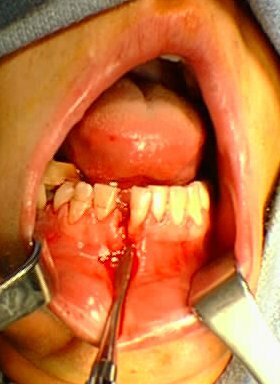 Intraoperative digital photograph of mandibular symphysis fracture showing fracture diastema. 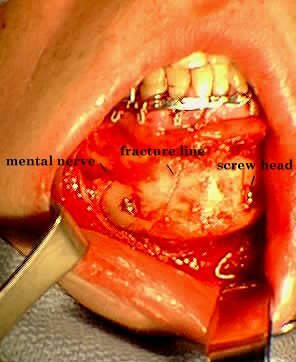 Intraoperative digital photograph of reduced mandibular symphysis fracture via lag screw technique. Note right mental nerve. Postoperative radiograph of reduced mandibular symphysis fracture via lag screw technique.